FALLS CHURCH, Va. and LAS VEGAS, N.V., April 10, 2015 /PRNewswire/ — CheckVideo, the Managed Video Security Leader, today announced the immediate availability of the HD Analytics Gateway™ (model CV4IP) to security dealers, video system integrators and end users. The company also announced the availability of the updated and refreshed CheckVideo CloudVMS™, the comprehensive suite of managed software services that are the video management system for all CheckVideo solutions, which features secure, cost-effective HD cloud video backup. The CheckVideo CloudVMS™ is currently providing full management of live customer deployments from 1 to 500 cameras, and last month alone, processed, delivered and securely stored more than 22 million alert events. 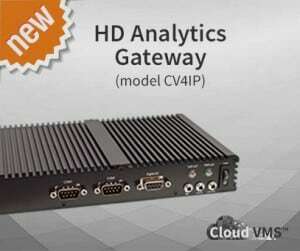 Combining the best of video analytics, on-site recording and display functionality with Cloud video backup in a compact, low-power form factor, the HD Analytics Gateway will enable advanced detection for up to 16 IP cameras. This will greatly simplify large multi-site video deployments without significant server, software or bandwidth provisioning and without the additional expense of having to purchase analytics software licenses. CheckVideo will be presenting its comprehensive video security solutions, including the HD Analytics Gateway and CloudVMS™ at ISC West, 15 to 17 April, at the Sands Expo Center, Las Vegas, NV, USA. Please visit our booth number 32051 and take a look at our solutions.